There are times, when mouse or keyboard won’t do the job on hand. Controlling applications sometimes needs special interfaces. A sturdy buzzer or wireless transmission is required. Sometimes, even switching a signal is required. That’s why I developped this PCB. It contains several modules that may come in handy to solve a special task. 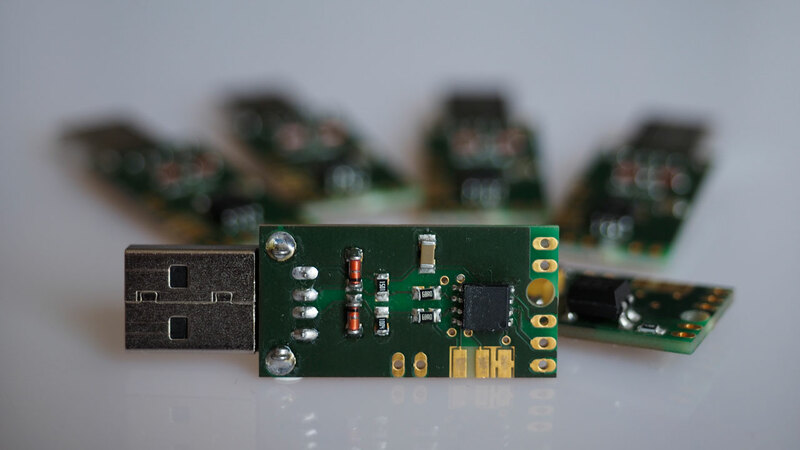 The core element of the PCB is a free programmable USB HID device. It features two pins, that may be independantly configured as input or output. Therefore it is also possible to signal a status or switch a device. To protect the connected PC, one of the inputs is available as isolated input. Extensions may be powered through a voltage regulator which providse 3V output. 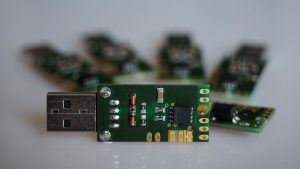 The PCB may be equipped with an USB A plug or a cable. The circuit is designed to be controlled by common open source software packages. I provide a basic implementation that sends a left mouse click when shorting one of the inputs to ground. Other implementations are available on request. Curently, I use this PCB to wireless control a Breeze Photobooth. The Yongnuo receiver I use, needs a 3V power supply, which is provided on the PCB. I built a small batch of devices. Please use the contact form to place orders.